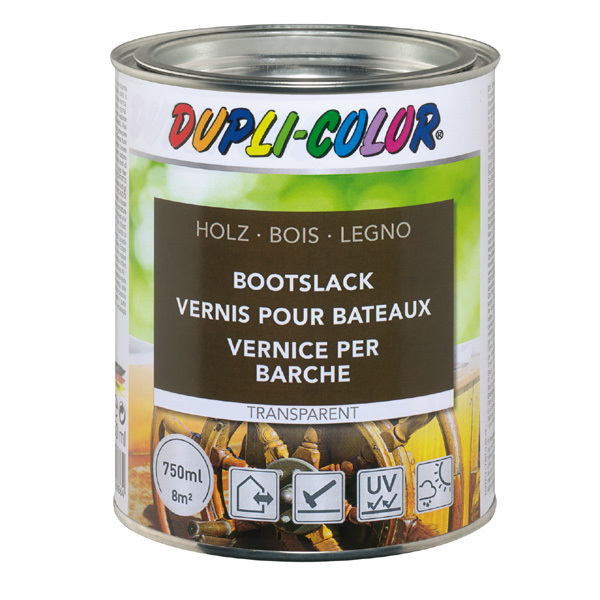 DUPLI-COLOR Spar Varnish glossy is an aromate-free synthetic lacquer for the transparent varnishing above the water line. Brush with a glazing brush or roll with a synthetic roller oder use an airless gun (bring with universal thinner to spray viscosity. If used in outside premises, apply a coat of wood primer. Do not work in the sun or during rain. Apply only over water. 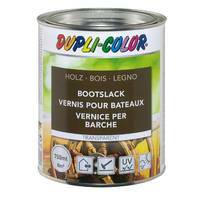 Cover directly weathered areas outside with lasures or any other covering material (e.g. synthetic paint). Clean the tools immediately after use with a brush cleaner. Start to brush at corners or edges. Use therefore a brush. Then apply coating in cross-coats. Consider a drying time of 24 hours between the layers. Can be used with tools for solvent-based laquers.